Team USA Sweeps Drone Worlds Wing Class « Big Squid RC – RC Car and Truck News, Reviews, Videos, and More! 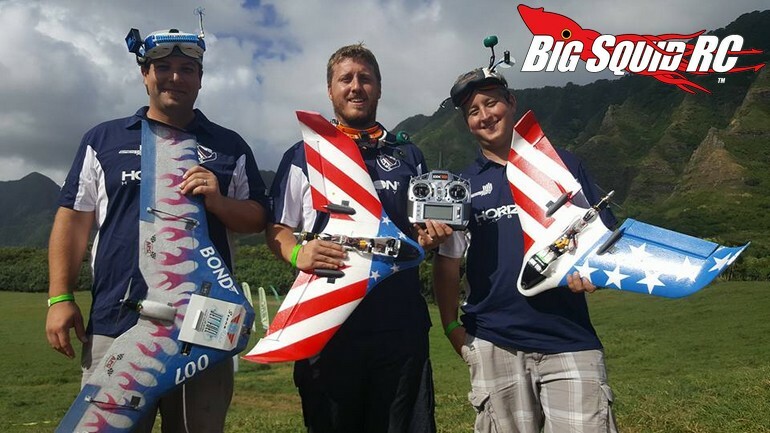 The hot news just in from Kualoa Ranch, Hawaii is that Team USA swept the top postions in the Wing Class at the Drone Worlds that were held over the weekend. Team USA was sponsored by Spektrum FPV along with Horizon Hobby. The Drone Worlds is one of the most prestigious events in the FPV world, we are stoked to hear that Team USA went out and crushed the competition. Horizon Hobby pilots took the top three spots with Jeremiah Guelzo in third, Steve Petrotto in second, and with James Haley taking the big win in first place. There are a bunch of videos and pictures from the Drone Worlds over on the official Horizon Hobby Facebook Page. You can check that out to learn much more about FPV racing, or you can Click Right Here to read more of the latest Horizon Hobby news on BigSquidRC.